The Apple Watch starts hitting wrists today with one of the most incredibly enormous user guides ever produced for an Apple product: 23 topics, almost 100 pages, not even including the 10 videos to teach people how to use this thing. Apple started creating “guided tours” for its new products back in 1984—here are some highlights from over the years. The original Apple guide came as a guidebook, floppy disk, and audio cassette tape to introduce owners—many of whom had never owned a computer before—to the game-changing Macintosh. Of particular interest is the “Mousing Around” section that taught users how to operate something we now think of as an appendage to our own hands. One might argue that Apple’s very first tablet was the Newton, which was like operating a tiny black handheld Mac. The guidebook was accompanied by this VHS tape which teaches users—mostly busy, on-the-go business folk, as you can see—how to manipulate the stylus to turn handwriting into text, and send messages via email, a brand-new concept. The possibilities are just limitless! 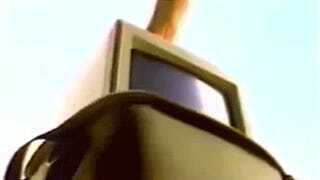 On a Quicktime video delivered via CD that came with the computer, users are introduced to the new and improved candy-colored iMac. Highlights: An infrared scanner to allow you to easily share files between computers! In fact, about half of the video is used to explain all the various ports and how you connect to them. First of all: How cute is this lil’ guy? This video that was released with the first iPhone was also the first of the guided tours to appear online. It explained how to move between screens with a flick of the finger, and also introduced the concept of “pinching” to zoom in or out. Probably the hardest thing to learn here was how to actually place a call! With the release of the iPad there wasn’t a particularly steep learning curve: Users were plenty familiar with the basic interface from their iPhones as well as the gestures like swiping and pinching. These guided tours were broken into sections to educated users about certain apps and how they were enhanced by the iPad’s interaction. In 10 different videos, the guided tours for the Apple Watch cover everything from how to use Apple Pay to how to voice-text to how to track health and fitness data. In a way, Apple’s guided tours are right back where they started: With this brand new piece of hardware, users also have to learn a whole new way to operate it.